Affiche et trailer pour le film d'animation Danois : Albert ! Voici un long-métrage d'animation Danois qui s'intitule 'Ole Lund Kirkegaard's Albert' (Albert) qui fut réalisé par Karsten Kiilerich et produit par M&M Productions et A. Film Production. Histoire (v.o) : In Kellyville, the smallest and cosiest city in the world, live two would-be scoundrels, Albert and Egon. Albert wants to become a hot-air balloon captain, but this doesn’t really fit in with Egon’s plan of becoming a pirate. In spite of their disagreement, the two boys end up in the same barrel on their way to adventure. They encounter the pickpocket Rapollo and his two thieving assistants, as well as a couple of annoying policemen. Their friendship is severely put to the test. Luckily they meet Jumilla, the daughter of a fortune teller, who manages to set things straight between the two and thereby becomes their new best friend and ally. 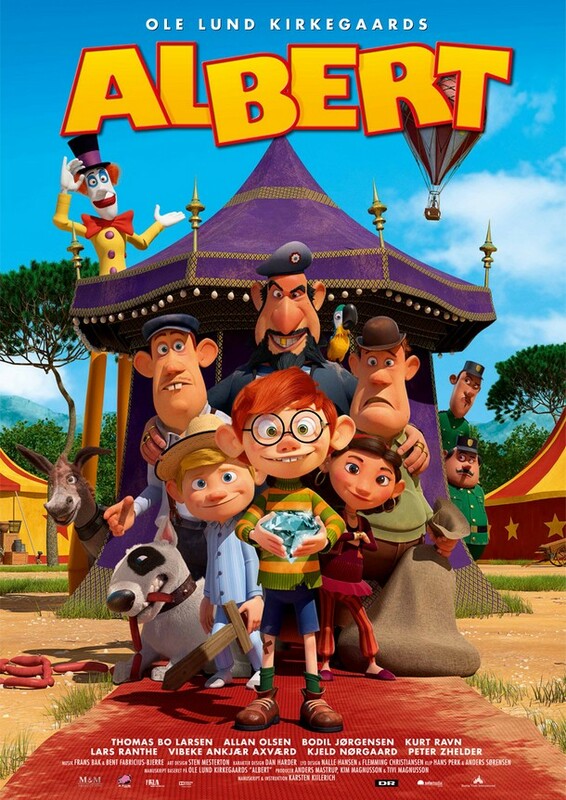 Ce film d'animation sera distribué dans les salles danoises à partir du 26 février 2015. Il est présenté en mars, lors du prochain Cartoon Movie de Lyon.